Participants of the Investment Competitiveness Forum, hosted by the World Bank Group in October 2017, discuss policies to reduce investor uncertainty. 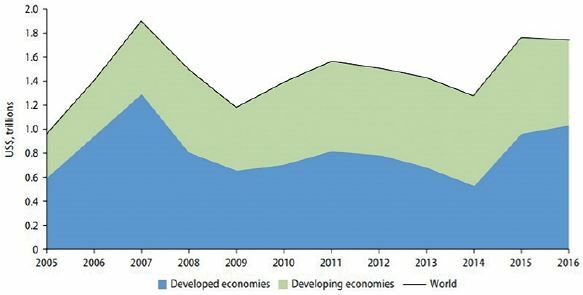 For many developing countries, foreign direct investment (FDI) has become the largest source of external finance, surpassing official development assistance, remittances, or portfolio investment flows. In 2016, more than 40% of the nearly $1.75 trillion of global FDI flows was directed to developing countries, providing much needed private capital. The benefits of FDI, however, extend well beyond attracting capital. In today’s global economy, better paying jobs depend on the production of new and better goods and services, and on finding more efficient ways to produce them. FDI is a key vehicle to enable the transfer of technical know-how, and managerial and organisational skills. It also helps countries diversify their exports and improve access to foreign markets. FDI thus has a significant potential to transform economies through innovation, enhance productivity, and create better-paying and more stable jobs, both in sectors attracting FDI as well as in the supportive industries. Despite the increasing role FDI plays for developing countries, the financing required to achieve the Sustainable Development Goals (SDGs) remains large and largely unmet. To meet the SDGs, private investment will have to expand into new territories. For countries seeking to increase levels of private investment, what policies or approaches should they prioritise? What drives the investment decisions of multinational corporations? Research from the World Bank Group seeks to answer these questions. 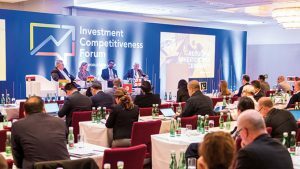 A recent survey of 750 executives from multinational corporations – presented in the Global Investment Competitiveness Report – finds that investment decisions are driven not only by the characteristics of individual investment projects, but also by the underlying conditions in a country. The survey confirms that above all, a country’s political stability and security matters for investment decisions. The legal and regulatory environment in a country was also important. Laws that are in line with international best practices combined with transparent and predictable administrative processes can make or break a country’s desirability as an investment location. Surprisingly, low labour costs and low tax rates were a critical factor to only one in five interviewed executives. Indeed, further research suggests that investment incentives – such as low tax rates and tax holidays – are generally effective only when investors are wavering between similar locations as a new base for their exports. When investment is motivated by a desire to access a domestic market or extract natural resources, incentives are generally ineffective. Figure 1: FDI Inflows, Global and by Development Group, 2005-2016. Source: Statistics and World Investment Report 2017, UNCTAD. Knowing what matters to investors gives policymakers an edge when it comes to attracting FDI. Armed with this information, policymakers can design rules and regulations designed specifically to influence the decisions of potential investors. Yet, it is nearly impossible to apply a one-size-fits-all approach to investment policy and promotion. Investors prioritise different investment factors depending on their business goals. Moreover, different types of investment affect development in different ways. For instance, investments leveraging a country’s natural resources will have different effects on socio-economic development and respond differently to investment climate factors than investments seeking to sell to the domestic market. Further, maximising FDI extends beyond attracting new investments. Governments must address policy challenges throughout the investment lifecycle, from attraction to entry, expansion, and linkages with the local economy. Lawmakers need a nuanced understanding of all these factors to generate benefits from FDI. The problem is that policymakers often face a shortage of hard evidence regarding what works. The World Bank Group, which regularly works with its client governments to help them articulate a vision for investment and prioritise reforms to achieve their goals, is uniquely positioned to help fill this knowledge gap. Its new Investment Reformers Network recognises countries which have made effective reforms relevant to international investors and shares these success stories with other governments. By doing so, the network increases the visibility of transformational investment policy and promotion reforms and rewards those governments that have been especially committed to reform. The network highlights their reform stories for other governments to emulate and to increase investor awareness of the reforming economies as potential destinations for foreign investment. Such recognition also helps to bolster the political will for client governments to continue advancing evidence-based investment policy and promotion agendas. At the first meeting of the Investment Reformers Network in October 2017, the World Bank Group recognised from its portfolio of client governments twelve countries, which have achieved significant investment policy and promotion reforms – Armenia, Ethiopia, Georgia, Ghana, Guinea, Kazakhstan, Mongolia, Myanmar, Pakistan, Saudi Arabia, Serbia, and Tunisia. Figure 2: What influences investors’ decisions? 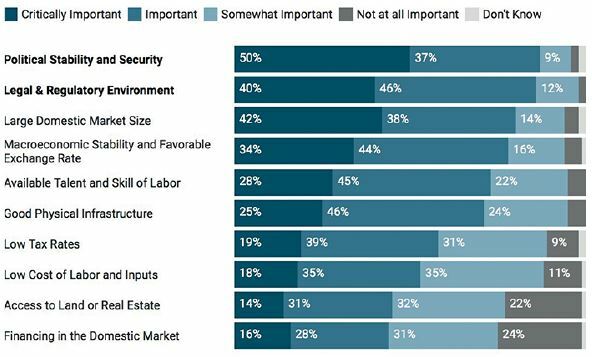 In a survey of 750 executives of multinational corporations, political stability and friendly regulatory environment were top investment decision drivers. Source: Global Investment Competitiveness Report. Ethiopia is in the process of a potentially historic economic transformation. Showing bold leadership in Africa, the government’s economic strategy has focused on the transformation of agriculture, the development of manufacturing sector, and the fostering export diversification. Ethiopia’s Vision 2025 strategy aims to achieve an annual growth rate of 11% and create two million manufacturing jobs in medium and large firms. By 2025, Ethiopia envisions an economy increasingly driven by exports and manufacturing. To achieve this vision, the government is promoting FDI to accelerate industrialisation, boost and diversify exports, and better integrate its market with the global economy. Under this plan, targeted and high quality FDI will play a key role in job creation, export promotion, and in developing domestic capabilities. Ethiopia’s development strategy has started to deliver positive results. In 2016, the country’s GDP grew by 7.6%, making Ethiopia one of the world’s fastest growing economies. Furthermore, its FDI inflows have increased from $278 million in 2012 to nearly $4 billion in 2016. The recent establishment of major FDI manufacturing projects in the country’s industrial parks, such as the PVH-led investment in Hawassa with its planned 60,000 jobs, shows promise for the success of Vision 2025. Figure 3: FDI in Ethiopia is on the Rise. FDI inflows to Ethiopia increased from $278 million in 2012 to nearly $4 billion in 2016. Source: World Bank Group. Governments can take specific actions to encourage and attract FDI that benefits their own local firms and businesses. Investment incentives or investment guarantees are frequently used to boost local economy’s competitiveness for FDI. In some industries, this type of de-risking can help, however, fundamental weaknesses in a country’s investment climate must be addressed first. Even the most generous incentive packages are unlikely to sway investors if they cannot obtain a business license, enforce contracts, or get a construction permit. Encouraging transparent and predictable conduct within government agencies can go a long way to boost investors’ confidence in a particular location. Limiting or eliminating bureaucratic inefficiencies, complex regulations and procedures, and unpredictable or arbitrary government conduct can signal that a country is open for business. Finally, investment protection can be even more critical than investment promotion. Government efforts should aim to encourage investors to stay in the country and expand their operations. Policy initiatives should include strengthening investor protection guarantees, providing proactive investor aftercare, and managing grievances. To maximise the gains from foreign investments, developing country governments must adopt effective reform strategies, champion reform at the highest political levels, and strengthen interagency coordination. They must also balance the public interest with investor preferences to ensure that the host country truly benefits from FDI. An effective FDI policy does not favour foreign investment over domestic; rather, it links the two to build a relationship between firm and host country that is mutually beneficial. 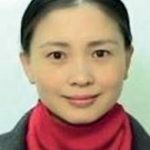 Christine Zhenwei Qiang, a Chinese national, is Practice Manager for Investment and Competition of the World Bank Group’s Macroeconomics, Trade & Investment Global Practice. Her teams advise client governments in over 100 countries on catalyzing competition and private investment through legal, policy, regulatory and institutional reforms. Christine joined the World Bank Group in 1998. Prior to joining the Investment Climate Department in 2011, she was Lead Economist at the Policy Division of the Global ICT Department of the World Bank Group. Her main responsibilities included overseeing the Bank Group’s analytical agenda on ICT policies, private investment in telecom infrastructure, economics and impact analysis, as well as leading operations and policy dialog in Asian countries. She has published many journal articles, book chapters and reports on private sector development, economic growth and productivity. She has a PhD in Economics and a M.S.E. in Computer Science and Engineering from Johns Hopkins University and a BA in German Language and Literature from Shanghai International Studies University in China. 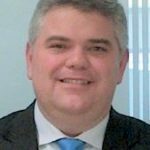 Roberto Echandi is the Investment Policy Global Lead in the Macroeconomics, Trade and Investment Global Practice of the World Bank Group. 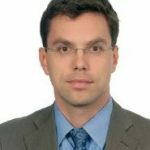 Prior to joining the World Bank Group, he was Director of the Program on International Investment at the World Trade Institute (WTI) of the University of Bern. Appointed Ambassador of Costa Rica to Belgium, Luxembourg and the European Union (2007-2010). He also served as the Chief Negotiator of Costa Rica to the negotiations of the Association Agreement between the European Union and Central America. Echandi undertook his doctoral and LL.M. studies in International Trade Law at the University of Michigan School of Law at Ann Arbor, Michigan; his M.Phil. in Latin American studies with emphasis in economic integration at the University of Oxford. He has published extensively on the legal and political economy dimensions of investment issues, dispute settlement, trade in services and regional economic integration in the Americas. Peter Kusek leads the Applied Research Program on Investment and Competition at the World Bank Group’s Macroeconomics, Trade and Investment Global Practice. His team produces new research on investment, develops analytical tools, and implements novel diagnostic approaches supporting economic policy reforms in developing countries. Kusek specializes in foreign direct investment and advises developing country governments on investment climate reforms. Kusek has led several flagship publications, including the Global Investment Competitiveness Report and Investing Across Borders Report. Prior to joining the World Bank Group, Kusek worked on small-enterprise development in Bangladesh, on microfinance in Tanzania, and on structural reforms at the Ministry of Finance of the Czech Republic. He was also program manager at the Center for Strategic and International Studies, a Washington-based foreign and security policy think tank. Peter holds a master’s degree in economic policy and international development from Princeton University’s Woodrow Wilson School of Public and International Affairs.